Emil Theodor Kocher (1841 – 1917) was a Swiss Surgeon. Along with Lister and Hallsted, Kocher introduced aseptic technique to surgical operations greatly reducing mortality rates. The surgeon is a doctor who can operate and knows when he should not do it. Thyroid Surgery: Extensive work on the thyroid gland. Based on his 1883 work on the thyroid gland’s function in metabolism and demonstration that thyroid surgery should be ‘hygienic’; associated with minimal blood loss and that a viable part of the gland needs to be left intact following the operation. Kocher incision – ubcostal incision performed on the right side exposes the gallbladder and common bile duct, and on the left side gives access to splenectomy or splenorenal venous anastomosis. Kocher Reflection (Kocher’s reflex) – contraction of the abdominal muscles subsequent to the exploratory compression of the testicle. Kocher T. Eine neue Reductionsmethode für Schulterverrenkung. Berliner Klinische Wochenschrift 1870; 7(9): 101-105. Kocher T. Chirurgische Operationslehre (Text-Book of Operative Surgery). Jena, Fischer, 1892. Kocher T. ‘Vorlesungen über chirurgische Infektionskrankheiten’ (Lectures on surgical infectious diseases) Basel-Leipzig, C. Sallmann, 1895. Kocher T. Zur Pathologie und Therapie des Kropfes. Deutsche Zeitschrift für Chirurgie, Leipzig, 1874, 4: 417-440. Aguirre CP. 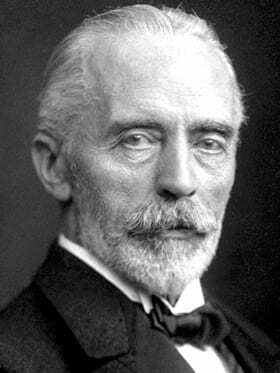 Biography: Emil Theodor Kocher (1841-1917). University of Valencia – CSIC 2002.